The 8051 Microcontroller is a Microcontroller designed by Intel in 1980's. It was based on Harvard Architecture and developed primarily for use in Embedded Systems. Originally it was developed using NMOS technology but as those requires more power to operate therefore Intel redesigned Microcontroller 8051 using CMOS technology and later versions came with a letter 'C' in their name, for example: 80C51. These latest Microcontrollers requires less power to operate as compared to their predecessors. Microcontroller 8051 has two buses for program and data. Thus it has two memory spaces of 64K X 8 size for both program and data. It has an 8 bit processing unit and 8 bit accumulator. It also includes 8 bit B register as main processing blocks. It also have some other 8 bit and 16 bit registers. Microcontroller 8051 have an built in RAM for internal processing. This memory is primary memory and is used for storage of temporary data. It is Volatile memory i.e. its contents get vanished when the power is turned OFF. Central Processor Unit(CPU): As you may know that CPU is the brain of any processing device. It monitors and controls all operations that are performed in the Microcontroller. User have no control over the work of CPU. It reads program written in ROM memory and executes them and do the expected task. Interrupts: As its name suggests, Interrupt is a subroutine call that interrupts Microcontroller's main operation or work and causes it to execute some another program which is more important at that time. The feature of Interrupt is very useful as it helps in cases of emergency. Interrupts gives us a mechanism to put on hold the ongoing operation , execute a subroutine and then again resumes normal program execution. The Microcontroller 8051 can be configured in such a way that it temporarily terminates or pause the main program at the occurrence of interrupt. When subroutine is completed then the execution of main program starts as usual. There are five interrupt sources in 8051 Microcontroller. 2 of them are external interrupts, 2 timer interrupts and one serial port interrupt. You May Also Like: What is Microcontroller? How it Works? Memory: Microcontroller requires a program which is a collection of instructions. This program tells Microcontroller to do specific tasks. These programs requires a memory on which these can be saved and read by Microcontroller to perform specific operation. The memory which is used to store the program of Microcontroller, is known as code memory or Program memory . It is known as 'ROM'(Read Only Memory). Microcontroller also requires a memory to store data or operands temporarily. The memory which is used to temporarily store data for operation is known as Data Memory and we uses 'RAM'(Random Access Memory) for this purpose. Microcontroller 8051 has 4K of Code Memory or Program memory that is it has 4KB Rom and it also have 128 bytes of data memory i.e. RAM. Address Bus: Microcontroller 8051 has a 16 bit address bus. It used to address memory locations. It is used to transfer the address from CPU to Memory. Data Bus: Microcontroller 8051 has 8 bits data bus. It is used to carry data. Oscillator: As we know Microcontroller is a digital circuit device, therefore it requires clock for its operation. For this purpose, Microcontroller 8051 has an on-chip oscillator which works as a clock source for Central Processing Unit. As the output pulses of oscillator are stable therefore it enables synchronized work of all parts of 8051 Microcontroller. Input/Output Port: As we know that Microcontroller is used in Embedded systems to control the operation of machines. 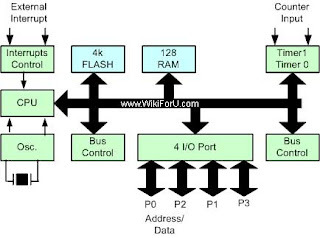 Therefore to connect it to other machines, devices or peripherals we requires I/O interfacing ports in Microcontroller. For this purpose Microcontroller 8051 has 4 input output ports to connect it to other peripherals. Timers/Counters: Microcontroller 8051 has 2 16 bit timers and counters. The counters are divided into 8 bit registers. The timers are used for measurement of intervals , to determine pulse width etc.